A recent update to Google Play Music (version 7.9.4920) brought along some unwelcome features with it. The update included a Bluetooth related bug, that in many cases, caused the app to crash as soon as it was opened. The update was sent to add support for the notification channels that will be available with Android O, and to change the look of the search history view on the streaming music service. Now, a new update for Google Play Music has quickly hit the Play Store. Carrying version number 7.9.4921, the new offering's changelist simply reads "Bug fixes." 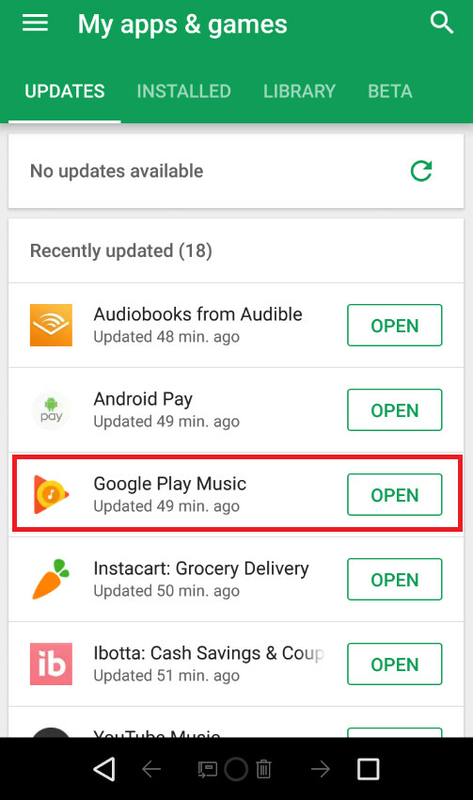 Before applying the new update, opening Google Play Music with a Bluetooth device paired to your phone would cause the quick crash that we referred to in the beginning of this story. If you already have Google Play Music installed on your handset (it is pre-installed on most Android models after all), chances are that the update has already arrived. To see if that is the case, open the Google Play Store. Tap on the hamburger menu inside the search bar on the left side. Click on My apps & games and you should see Google Play Music under the Recently updated tab. The world can now resume spinning. Yeah it sucked! Glad they were on top of it. I was pissed off when I wasn't able to listen to my music on my way to work, I had to resort to listening to the radio. So glad they were able to resolve the issue right away though. I'm not happy with Google about this. Where's their quality & testing apartment? This affected me. I couldn't listen to music at all yesterday. I disabled the app, to see if that would fix the issue, and that deleted all my music...that I downloaded to my phone - which doesn't make sense to me as to why it was deleted. The music was deleted because the files are stored within the app, not separately. And while I was pissed off at Google, you have to remember that humans are doing the programming and they are prone to errors from time to time. Just be grateful that it was resolved after a few hours with a quick update. lol, I had lost all my music on my Google Play Music app when I updated my OS to the O beta. I was really upset because I have almost 45GB of music downloaded. -_- so my music library is gone. WTF. Gonna need an update that goes back 2 updates to when s**t worked.